ENCALS is delighted to announce the winner of the prestigious Young Investigator Award as Dr. Martin Turner of Oxford University. Dr Turner won the award for his research into imaging and biomarker discovery in ALS. Using advanced brain imaging methods, he has found a common pattern of nerve damage in the brains of ALS patients. This might offer a way to measure disease progression, which is something that has not previously been possible and would be very important for diagnosis, clinical trials and understanding how ALS spreads. The award was designed to recognise the brightest and best young scientists in ALS, and is given for outstanding research. It is judged by an international panel of experts on any or all of novelty, clinical impact, and challenge to existing ideas about ALS, as well as the strength of publications, grants and previous achievements for each applicant. The competition is open to anyone aged 40 or less on 1 September of the award year. The standard has been consistently very high, which is very encouraging for the future of ALS research. 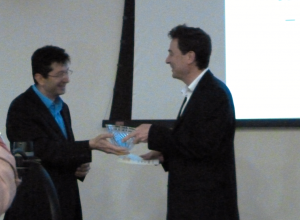 The award was given to Martin Turner by Prof. Ammar Al-Chalabi, chair of the ENCALS award committee.